These replicas were sold in many countries for relatively low prices. The endeavor was quite successful and the demand for replicas increased. 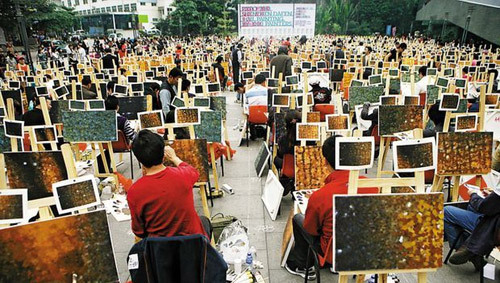 In order to fulfill the demand more and more artists took up residence and started to make a living, the estimate (2006) being in the thousands. 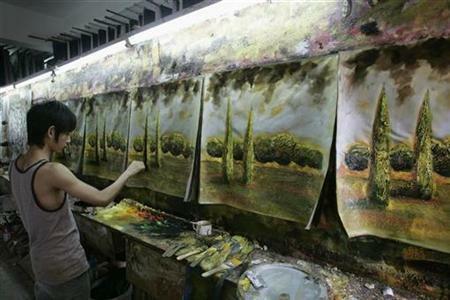 Many of the artists are trained at art academies in the required techniques and produce dozens of replicas daily. 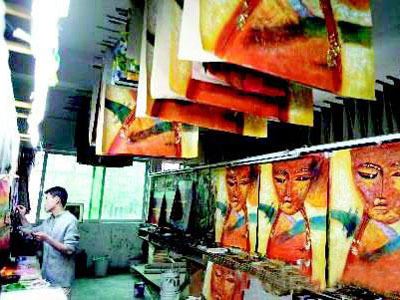 The official policy states that these replicas are of paintings of artists who have died more than seventy years ago and consequently out of copyright. An obvious exception to this would be Andy Warhol (cited above) who died in 1987, and Dalí, who died in 1989. 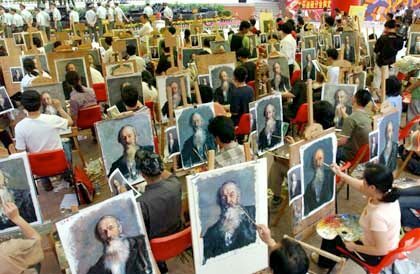 The only requirement is that it is made clear that these paintings are replicas. Currently, the village sells both originals and replicas. It is possible to commission paintings for low prices. The village is a gated development, recognizable by the large sculpture of a hand holding a paintbrush outside its gates. And not an original thought among them. Art begins in the heart … the object is just an artifact of a brilliant and unsolvable equation spinning in space, which makes the heart fill up so one must try to express this equation or burst. Agreed. Glad it evoked the same feelings it did for me? this is depressing and sad. to confuse art with commerce (I don’t mean that naively) and to confuse art with mass production. a copy is NEVER the same as an original, even if technically proficient, becuase a painting is made from the heart and a copy is made from the mind. tragic use of China’s very large and trainable work force. interesting choice for a post in which you often share some of the most original artists working today.